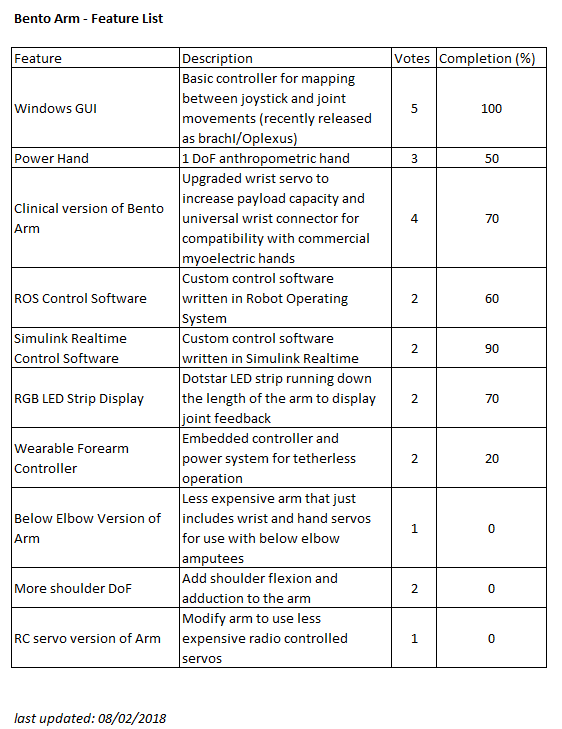 Do you have an idea for a new feature for the Bento Arm? Post it up here. I will maintain a list of your requested features along with a list of the features currently in development and their completion percentage. If you see a feature on the list that you would like developed please reply to this thread with the feature name and an indication of your vote. We are going to use your input to help prioritize the order we work on the features to make sure we get the most important ones to you the fastest. Once we have a decent amount of votes for a feature we will move it into the active queue and start trying to gather resources and team members to start pushing the feature towards open source release. I think it would be possible to add more degrees of freedom to the shoulder joint, but as you suspected I think it would add quite a bit of bulk to the shoulder especially if you wanted both abduction and flexion. It would be tricky to maintain the anthropomorphic feature of the arm with the extra servos. Another tradeoff is that the extra servos might possibly reduce the payload capacity of the arm. In any case it is an interesting proposition and I will add it to the feature request list.